Just in time for Labor Day and the end of summer fast approaching, this salad is the definition of fresh. The crunchy vegetables and tangy dressing are delightful. It tastes as good as it looks. 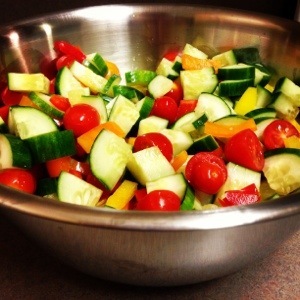 Place the chopped cucumber, peppers, tomatoes, and red onion in a large bowl. Whisk together the garlic, oregano, mustard, vinegar, salt and pepper. Slowly whisk in the olive oil. Pour the vinaigrette over the vegetables and mix. Slowly mix in the feta and olives. Refrigerate for 30 minutes prior to serving.